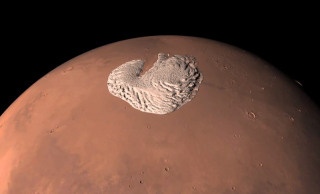 ESA's Mars Express provided data for a new animation of the Martian north pole. A 3D animation of views from a European spacecraft orbiting Mars is giving Earthlings a front-row seat to a stunning tour of the Red Planet's frozen north pole. The video of the Martian north pole draws on data from The European Space Agnecy's Mars Express probe. The spacecraft that has been orbiting the Red Planet for a decade. The northern ice cap on Mars has a diameter of about 621 miles (1,000 kilometers), roughly the width of Greenland's ice sheet at its widest point, going east west. Mars' north pole is made up of many thin layers of ice mixed with dust, which scientists think were deposited over a long period of time and now extend some 1.6 miles (2 km) deep. A conspicuous canyon called Chasma Boreale can be spotted in the virtual flyby. It bisects the cap, stretching nearly 200-mile (318-km) long. There are also smaller troughs in the ice sheet, arranged like the arms in a spiral galaxy, which scientists think were shaped by strong prevailing winds, according to ESA. The Mars Advanced Radar for Subsurface and Ionospheric Sounding instrument, or MARSIS, aboard Mars Express captured the data for this movie by bouncing low-frequency radio waves on the surface. The waves can also penetrate the layers of different materials underground. "The strength and timing of the radar echoes are a gauge of the depths of different types of interfaces, such as between rock, water or ice," ESA officials said in a description of the animation. "This information can then be translated into 3D views, as seen in this movie." Mars Express is the first spacecraft that ESA built to explore another planet. In addition to mapping the ice caps, it has detected methane in the Martian atmosphere and helped scout the landing site for NASA's latest Mars rover Curiosity.